The Bar-tailed Godwit, although very similar to the Black-tailed Godwit, can only be seen close to coastal areas like the Wadden Sea. 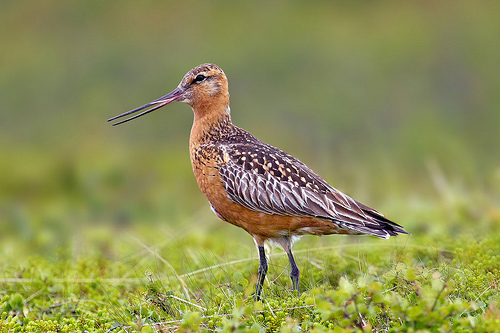 The Black-tailed Godwit is a bird of wet grasslands. The Bar-tailed Godwit has a slightly upward-curved beak. The Bar-tailed Godwit has shorter legs and a slightly upward-curved beak. 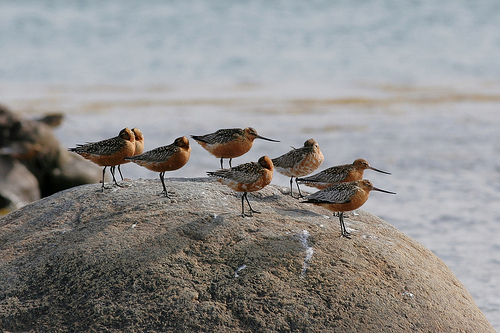 You will find the Bar-tailed Godwit only in coastal areas. In summer the Bar-tailed Godwit looks a bit like the Red Knot. Both have a reddish belly, but the Bar-tailed Godwit is much larger.